Washington state is a great place to bird all year. Besides having a number of year-round residents, winter delivers a number of migrants including seabirds, shorebirds and waterfowl. But spring and summer also deliver a number of exciting migrants that travel from as far as South America, where they overwinter, and move north to breed. Some of these birds, such as the Western tanager and the black-headed grosbeak, are especially exciting to see due to the males’ brilliant colors. A number of warbler species also come north in spring to add vibrant colors to Washington’s landscape. Wilson’s, yellow, yellow-rumped, orange-crowned and MacGillivray’s warblers and common yellowthroats can be found in all or most of Washington state in the spring and summer. Other warbler species such as black-throated gray, Townsend’s, hermit, and Nashville warbler as well as northern waterthrush, yellow-breasted chat and American redstart also migrate to the Evergreen State to breed. However, some birds in our state don’t migrate long distances, but rather disperse to various parts of the state with seasonal changes. Therefore, we may see these species on the coast, for instance, in winter, and in spring find them breeding inland. 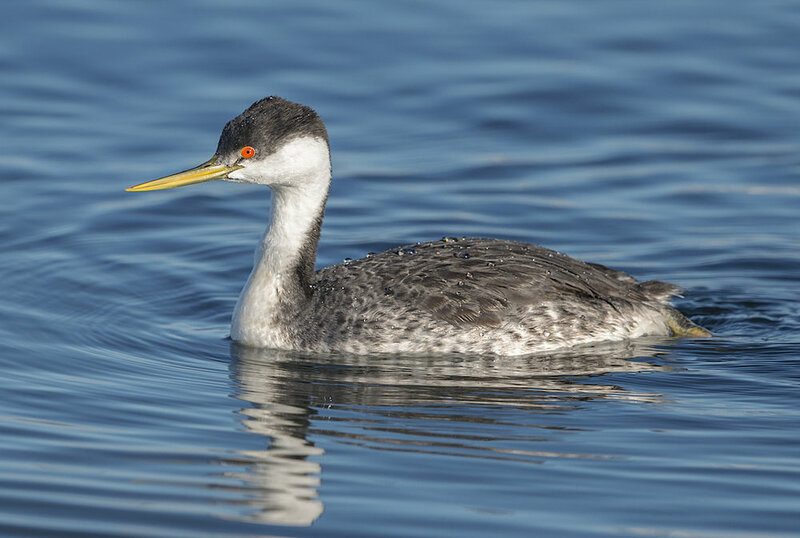 Such a bird is the Western grebe, which can be found along the entire coast of Washington in winter but breeds east of the Cascades. A number of species of waterfowl such as the ring-necked duck also disperse around the state, breeding east of the Cascades as well as in Canada, Alaska and a number of other states in the Lower 48. Adding to the bright colors of breeding migrants are such species as lazuli bunting, Bullock’s oriole and a number of swallows. Western and mountain bluebirds and Swainson’s thrush also visit the state in spring and summer. Non-songbirds that arrive during this time include turkey vultures, ospreys and Caspian terns, and tufted puffins breed off the Washington coast after spending the winter on the open ocean. While rare sightings of some hummingbirds are regularly reported in Washington in spring and summer, four species are regulars to the state in breeding season. Anna’s hummingbird is a year-round resident of Western Washington, having gradually increased its range northward in the last few decades, formerly wintering south of Oregon. But three other species migrate north to breed in our state. East of the Cascades, calliope, black-chinned and Rufous hummingbirds can be found. However, Rufous are the only long-distance migrants that breed in the western part of the state, most traveling from Mexico and Central America and some overwintering in the extreme southeastern part of the United States. To find out where you can see these avian visitors in Washington state and The Nature Conservancy’s preserves, you can consult a field guide or online at allaboutbirds.org. A beautiful day spent in my beautiful backyard with loved ones; life doesn’t get much better.